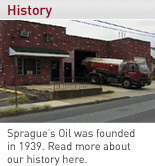 Part of Sprague's Oil comprehensive customer service package are the OIL TANK PROTECTIVE COVERS AND DOUBLE WALL TANKS. Installing this equipment gives homeowners one less thing to worry about. The Tank Mate, Pan, Tub, Tray, and Alarm are affordable containment solutions improving the look and safety of basement and above ground fuel oil tanks. 1 million dollar clean-up insurance and 10 year leak protection warranty available. 110% Containment for 275 and 330 oil tanks. 15 Gallon oil tank containment that installs in less than 30 Seconds. Place under tank and snap in the supplied clips .